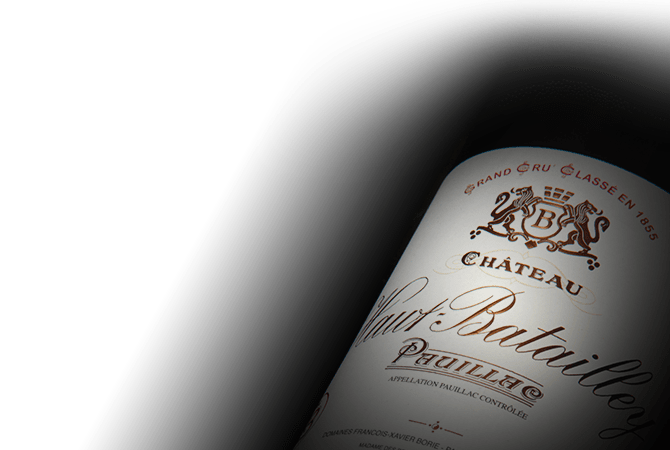 An symbolic property of the famous Pauillac appellation, the name Château Haut-Batailley is derived from the word "battle" in memory of the battles that may have taken place on the estate at the end of the Hundred Years’ War in the 15th century. A Fifth Classified Growth of the Official Classification of 1855, the estate has always been among the best wines of the Médoc on the Left Bank of the Bordeaux region. Owned by Madame Des Brest-Borie and her family since the 1930s, Château Haut-Batailley was previously managed by François-Xavier Boire. Château Haut-Batailley sees a new page of its history written in 2017 with its ownership being transferred to the Cazes family. They are continuing the work initiated by the Borie family in order to preserve the style and the quality of this essential and reputable wine. The magnificent estate is spread over 40 hectares, including 22 hectares with vines averaging 35-years-old. The Château Haut-Batailley has a typically Médoc blend that prides itself in the use of the black varieties of the region with its blend consisting of Cabernet Sauvignon (70%), Merlot (25%) and Cabernet Franc (5%). With modern technical facilities and a dedicated team, the future of Château Haut-Batailley promises to be auspicious for its future vintages that will continue to shine as one of the finest references in the Pauillac appellation.